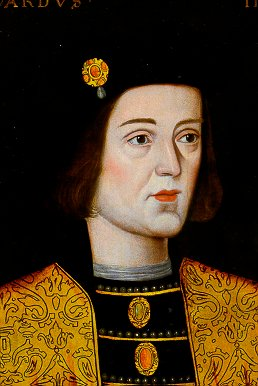 Edward IV was the son of Richard, Duke of York. Edward was born at Rouen in the year 1441. When Edward came of age, a fierce struggle between the Houses of York and Lancaster was underway, which would embroil England in a bitter civil war. During this period of turmoil, Edward proved himself to be a man of great courage and military skill. He won a major victory over the Lancastrians, at Northampton during July, 1460. Again victory was his in the following year at Mortimer’s Cross during February, 1461. Following these two major battles, Edward marched on London, and was proclaimed King of England in 1461 deposing Henry VI. After being proclaimed King, his opposition attempted one last battle for power. Within weeks of his coronation, Edward set out to confront the Lancastrians once again. Edward emerged victorious defeating his enemies at Towton, in Yorkshire for the third time. Nevertheless, the war continued with the fortunes varying back and forth until 1464. All seemed to be secure until Edward took a wife in 1464. His bride was Lady Elizabeth Grey, which so offended the Richard Neville, Earl of Warwick, commonly called the king-maker, that he switched sides and joined the Lancastrian party. 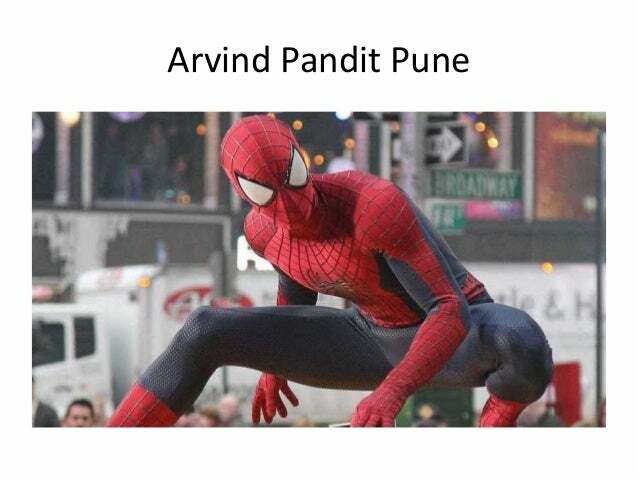 Once again civil war broke out. This time, Warwick defeated Edward’s forces near Banbury in the year 1469. Thereafter, Warwick departed for France, whence he returned with a supply of troops, and restored Henry VI to the throne. This second reign for Henry VI would prove to be a very short one indeed (October 1470-April 1471). Edward escaped beyond the sea, and returned with succours, and marched on London, where he took Henry VI prisoner. Edward then confronted Warwick on the field of battle at Barnet, in which Warwick fell. Thereafter, Edward achieved another victory at Tewkesbury, which secured at last his throne. Nonetheless, al was still not entirely calm. Preparations were made for war against France, but his invasion achieved nothing. War also broke out with Scotland, but no major battles of importance took place. In 1478, Edward had his own brother George, Duke of Clarence, condemned for treason and put to death. Edward died on April 9th, 1483. He was succeeded by his 12 year-old Prince Edward V who was under the guardianship of his uncle, Richard, Duke of Gloucester. However, within 11 weeks,Richard III usurped the throne and Edward V, along with his younger brother, were murdered in the Tower of London. NOTE: During the prolonged civil war, the effects of such vast expenditure is easily seen in the coinage that has survived. Due to the shortage of both gold and silver, we see a pronounced difference in the English monetary system during the reign of Edward IV. In 1464, the weight of the English penny was reduced from 15 grains to 12 grains while the gold noble was raised in value from 6s 8d to 8s 4d. 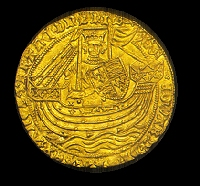 The following year, a new gold denomination was introduced known as the Ryal or ‘Rose Noble’ with a value of 10 shillings at a weight of 120 grains. Due to the fact that the old noble with a value of 6s 8d had become the standard professional fee, a new denomination became necessary – the Angel. This new Angel was valued at 6s 8d, but with a weight of only 80 grains.